Veronica Mars wears a surprising number of scarves for living in Southern California. 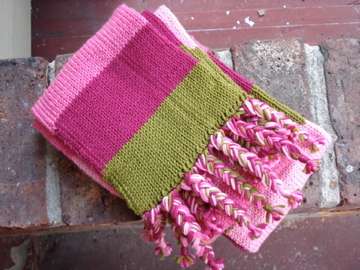 When I was going through my obsession with Veronica Mars I was inspired to knit the scarf she wears in Season 1, episode "Meet John Smith." Mostly I just really love pink and green. 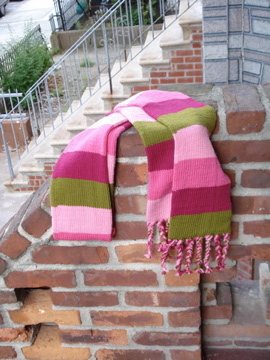 This scarf is knit in the round and out of Karabella Aurora 8. I love Aurora 8, it is extremely soft and very bouncy. This will go perfectly with the obscene amount of pink shirts I wear. It will also be the warmest scarf I own. I have been spending this Sunday adding fringe and finishing touches to a bunch of projects. It is my least favorite part of any projects since it seems to take an inordinantly long amount of time. I have a bit of a cold this weekend, which actually bodes well for all chores I normally find tedious. When I am loopy with a cold, I always end up cleaning.